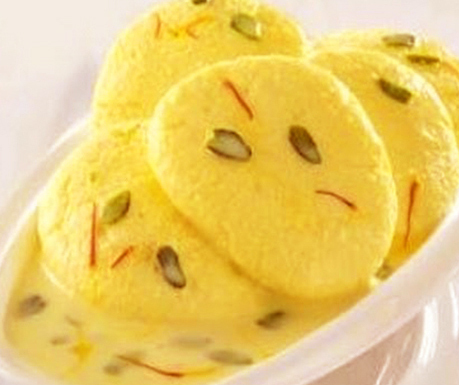 Rasmalai got its name from two Hindi words, ‘Ras’ means juice and ‘malai’ means ‘cream’. As the name indicates, the dessert is a juicy and creamy one. 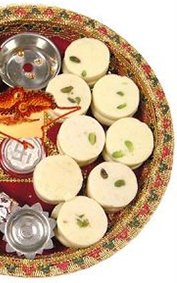 Here the step by step process of preparing luscious Rasmalai is given. 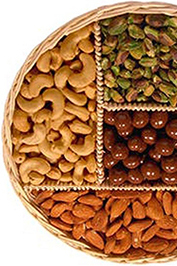 You can try them at home and share with your family and friends. Step 1: Keep a thick bottom vessel in the stove. Add 3 cups of milk and bring to boil. Step 2: Add sugar and saffron to the boiling milk and stir well. Stir continuously in order to get a thick creamy texture. Step 3: Take another vessel and add 5 cups of milk for making chenna. When it starts boiling, add the lemon juice to the milk slowly and stir well. When lumps are formed, set it aside for cooling. Step 4: Strain the chenna using a clean cotton cloth. Squeeze it tightly until the entire water content is gone. Put the chenna in a bowl and knead well in order to make it smooth. Make small balls of desired shape, either round or oval and flatten them. Step 5: Bring 2-3 cups of water to boil and add sugar to it. Stir well and add crushed cardamom. Add the chenna to this and cook it for 10 minutes after covering with a lid. Step 6: When it is cooked, take one by one carefully and place it on a plate. Slightly squeeze it to release the sugar. Add the chenna to the malai we have prepared. Step 7: Garnish the Rasmalai and serve chilled. Enjoy. Rasmalai preparation is a bit difficult task since it requires a lot of time and attention. You can enjoy the same homely taste of Rasmalai from the cookhouse of MM Mithaiwala. You can call us or order online for free home delivery. Check with your pin code whether delivery is available at your location. You are also welcome to the MM Mithaiwala shop.